3D laser holograms sound cool, but they're generally hot. As in, hot enough to burn your skin. But now researchers at the Digital Nature Group, a Japanese lab, say they've figured out a way to create a 3D laser hologram that is not only safe to the touch but interactive. 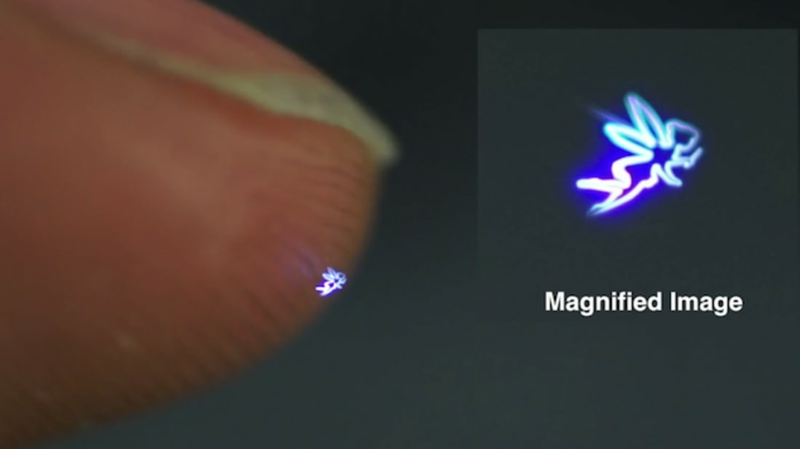 These "fairy lights" holograms are composed of light pixels called voxels fired at superfast speeds. (How fast? The laser bursts last 30 to 270 femtoseconds. A femtosecond is a quadrillionth of a second.) Voxels are emitted by plasma that's created when the laser's focused energy ionizes the air. Each tiny 3D image, many times smaller than the tip of a person's finger, is made up of about 200,000 voxels per second and is interactive based on touch. Some researchers reported that the holograms feel like sandpaper, and others like receiving a static shock. The interactive aspect is still simple—you can check a box or "break" a heart, for instance—but being able to touch the holograms at all represents progress. This isn't the first time scientists have used femtosecond lasers to create images suspended in the air. But previous attempts to do so had less sharp resolution—and burned human skin. The trick to fixing that was making the lasers fire in especially short blasts. Lab studies found that anything longer than two seconds will burn human skin (or at least the leather researchers used to represent human skin). But firing the lasers at bursts from 50 milliseconds to 1 second left the "skin" un-singed. For a more technical description and a chance to see the holograms in action, check out the video below. The technology is complicated, and likely prohibitively so. That is: don't expect holograms in your house anytime soon.